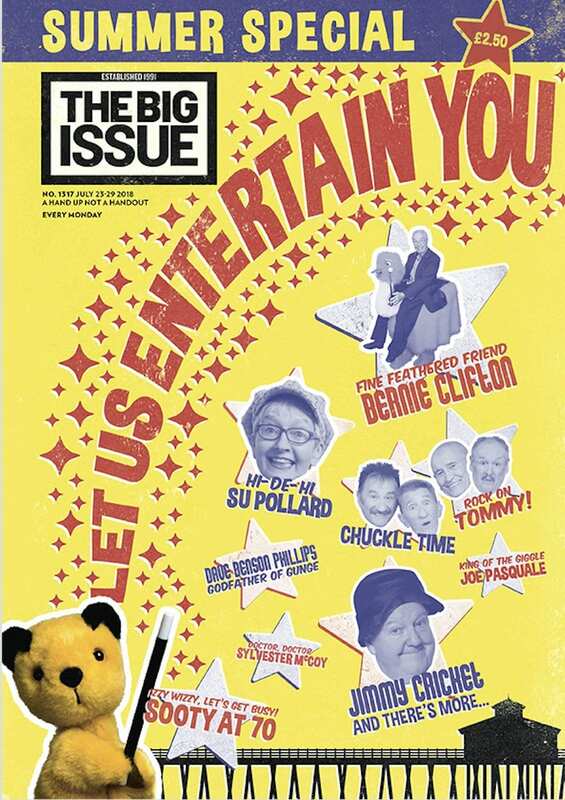 Jimmy Cricket is among a host of famous entertainers – described as “old-school greats” – to feature in the summertime edition of The Big Issue. Others include Cannon and Ball, the Chuckle Brothers, Sue Pollard from Hi-de-Hi!, Bernie Clifton and Joe Pasquale. The Big Issue is a street newspaper founded by John Bird and Gordon Roddick in September 1991 and published on four continents. It is written by professional journalists and sold by individuals. Its charitable foundation helps enable people who are homeless take control of their lives and earn a legitimate income. Mr McNamee is the first editor to manage The Big Issue across all national and regional editions as well as online. A regular media commentator, he has been named Editor of the Year three times by PPA Scotland, and was named British Editor of The Year in 2013 and 2016 by the BSME (British Society of Magazine Editors). 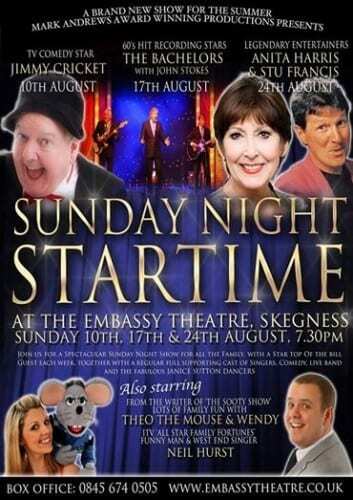 Jimmy Cricket met up again with TV characters Wendy Abrahams and Theo The Mouse when they all featured in a summer season spectacle at the beginning of August at the Embassy Theatre in Skegness, Lincolnshire. The show was part of a series of summer performances at the theatre, which also featured Anita Harris, Stu Francis and The Bachelors (see poster below). The Embassy Theatre line-up was produced by the theatre impresario Mark Andrews. 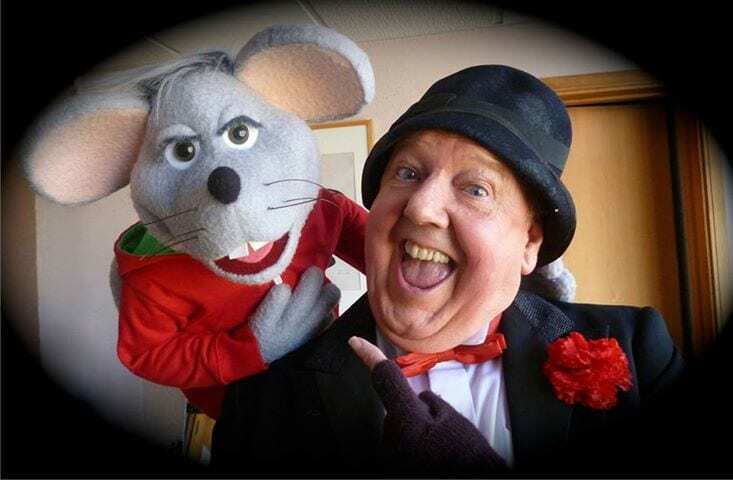 Although well-known entertainer Jimmy only headlined the first production, all three evenings featured Wendy, who features in CITV’s Sooty Show, and Theo The Mouse, a children’s character created by Wink Taylor. Wendy’s partner, Wink, helps out with Theo The Mouse and is also heavily involved with the latest television version of Sooty, which is broadcast on weekend mornings on ITV1. Northern Irish comedian Jimmy also met Theo and Wendy when he appeared at St David’s Hall in Cardiff, South Wales, towards the backend of last year. The Facebook page for Theo The Mouse can be found here. Jimmy Cricket had some special visitors when he appeared at St David’s Hall in Cardiff, South Wales. The famous funnyman was visited before the show by Theo the Mouse and Wendy. Wendy features in CITV’s Sooty Show and Theo the Mouse is a children’s character created by Wink Taylor, who has written for both the Sooty Show and the Basil Brush show. Watch video of Jimmy being interviewed by Wendy and Theo the Mouse.